← Can Cats be rehabilitated? Yes! or you might pay more you for latte. Can $5 really make a difference. The simple answer is yes! This is what $5 means to us. $5 means food for furry bellies. $5 means gas in our car to take furry cuties to and from the vet. $10 means vaccinations for one cat or dog for the year. $5 means a soft towel for furry butts, a soft blanket, a cat collar, a dog collar, a dog leash, a toy. 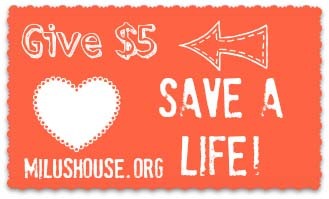 $5 means so much to us. It helps us to get Dog and Cats out of high kill animal shelter adopted or into foster care. Help us to save them. Give $5… and share our message. Together we can save every pet.